When state budget director Ben Barnes told reporters Connecticut had “entered into a period of permanent fiscal crisis,” he did so just 13 days after his boss, Gov. 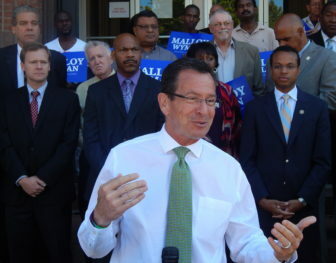 Dannel P. Malloy, had won the 2014 gubernatorial election with a polar opposite message. While Malloy dismissed a major deficit forecast and pledged not to raise taxes, his Republican opponent, Tom Foley was even more upbeat about delivering tax relief and closing the deficit. The challenge of wooing voters has taken on new dimensions as politicians increasingly are boxed in by Connecticut’s fiscal realities, and the 2014 gubernatorial campaign isn’t the only example. In recent years, Democrats and Republicans in the General Assembly have accused each other of making unrealistic if not ridiculous promises that fly in the face of the state’s mounting debts. Connecticut failed to tackle its retirement benefit obligations when they were manageable and until now, critics say, the politics of the moment — the next election — has trumped making tough choices that could infuriate voters. “Too often the focus is on scoring partisan points when we should be hammering out a plan,” said Ellen Shemitz, executive director of Connecticut Voices for Children, a New Haven-based, progressive advocacy group. “We’re on a collision course with insolvency,” said Suzanne Bates, director of policy and legislative outreach for the conservative Yankee Institute in Hartford, who added that Connecticut’s debts are mounting, its population is flat and the state Capitol is not responding. 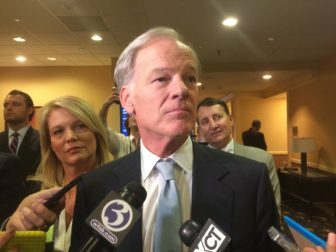 If there has long been a conspiracy of silence when it comes to Connecticut’s exploding debt, some Democrats charge, it deepened seven years ago when Greenwich businessman Tom Foley, a Republican, waged his first campaign for governor. 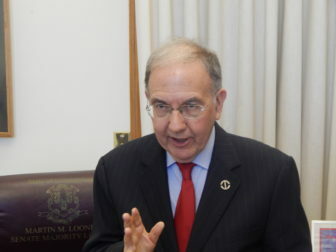 Foley, who narrowly lost the 2010 race to Malloy, infuriated Democrats when he said he could close a cavernous deficit in state finances without raising taxes. Gov. M. Jodi Rell and the 2010 legislature left office with a $3.7 billion hole built into the next state budget — a shortfall equal to nearly 20 percent of annual spending. Rising debt costs, eroding tax receipts, billions of dollars worth of programs propped up with expiring resources, and an empty budget reserve also awaited the winner. Foley said he could solve all of these problems without raising taxes, and without touching the state’s $2 billion package of education grants to local schools. When pressed to explain how, Foley told The Mirror that he expected 40 percent of the problem — about $1.5 billion — to be solved by economic growth alone. Malloy, who downplayed but never ruled out tax hikes, won that first race by a whisker. Five months into office he would sign more than $1.8 billion in tax increases into law despite concessions from state employees. He would be called ridiculously optimistic by critics when he assumed about half of the economic growth Foley had predicted. The Malloy administration began prepping a more upbeat fiscal message even before the 2014 rematch with Foley. The governor and his fellow Democrats in the legislature’s majority began cleaning up state finances — temporarily — well in advance of Election Day. Almost $200 million in annual debt payments were refinanced, effectively removing them from the last two years of Malloy’s first term and delaying them – plus about $40 million in interest charges – until after the election. More than $235 million in tax cuts were approved for consumers, businesses, the working poor, single-income tax filers and retired teachers — all of which were scheduled to begin after the election. And there was even to be a $55-per-person tax rebate — until plunging April income tax receipts forced Malloy to cancel this election-year maneuver. Still, the governor’s rosy campaign message was that Connecticut’s growing economy was poised to take off and that nonpartisan analysts’ warnings of sluggish growth and a $1.3 billion deficit in the first budget after the election simply were wrong. Despite that warning, the governor upped the stakes even more when he took to the campaign trail in the fall of 2014. Not only would he not raise taxes while delivering all of the approved tax cuts after the election, but he promised another $40 million in tax breaks — $20 million each for urban businesses and for college graduates struggling with student loan debt. Gov. Dannel P. Malloy unveils his proposal for urban small business tax incentives outside Faith Congregational Church in Hartford during the 2014 campaign. Not to be outdone, Foley said he wouldn’t raise taxes and would shave at least a half point off of the sales tax, saving consumers over $300 million per year. And after being pegged four years earlier as likely to take a slash-and-burn approach to the state budget, Foley — when pressed for details — ruled out one potential spending cut after another. Municipal aid would not be touched. State employees would not be laid off or asked to reopen contracts and provide concessions. “A deal’s a deal,” Foley said. Malloy’s success in his rematch against Foley wasn’t the only thing that stayed constant. After the election, the $1.3 billion deficit projection for the state budget hadn’t shrunk, let alone evaporated. 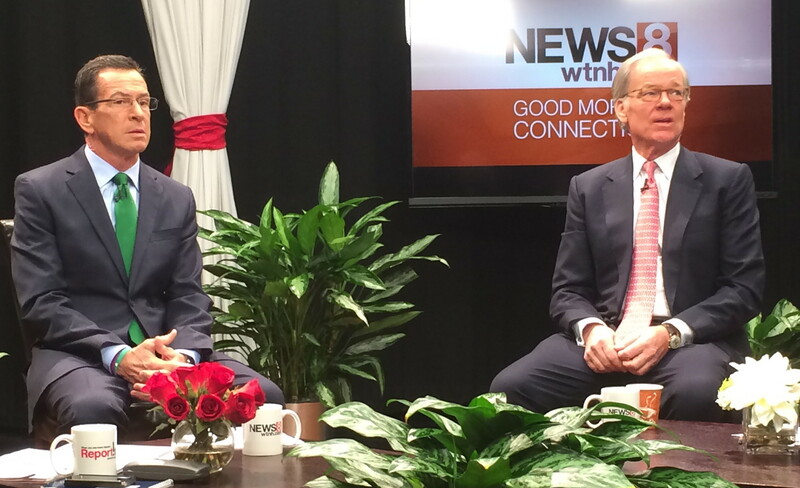 Barnes would try to reset expectations two weeks after his boss’s re-election win. Ben Barnes, the governor\’s budget chief, in June after telling agency heads the state would defer raises for non-union managers. Canceled or delayed nearly all of the $235 million in previously approved tax cuts. Made no mention of the tax cuts promised during the campaign to urban businesses and to college graduates. And proposed more than $325 million in new tax revenue, largely to be paid by hospitals and other corporations. The hospital provider tax calculation was “being updated” to reflect inpatient and outpatient receipts. In other words, unless a percentage-based, tax rate increase was proposed, it didn’t qualify as a tax hike. The final budget Malloy would negotiate with his fellow Democrats in the legislature’s majority also would cancel all previously approved tax hikes — except an $11 million income tax break for retired teachers — and further elevate the tax increase, beyond $675 million per year. Neither the business community nor Connecticut’s hospitals saw the distinctions as Malloy did in his budget message. “It means (hospitals) must provide care with even fewer resources” and make fewer investments in staff, medical equipment and other infrastructure,” CHA spokeswoman Michele Sharp said within days of Malloy’s budget proposal. Hospitals weren’t the only industry that blasted the new budget as an example of pre-election bait and post-election switch. Two of Connecticut’s corporate giants, GE and Aetna, led the way with harsh public statements in the waning weeks of the 2015 budget debate. The prospect of nearly $700 million in new taxes “makes businesses, including our own, and citizens seriously consider whether it makes any sense to continue to be located in this state,” GE warned. 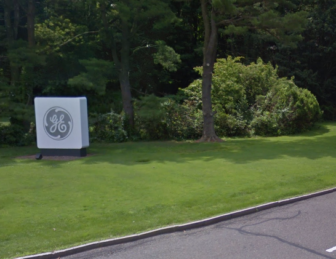 The GE logo marks the entry to its headquarter campus in Fairfield. And while GE chose to emphasize the advantages of the Boston metro area when it announced plans in January 2016 to relocate its Fairfield headquarters there, business advocates said GE’s thinking was clear. GE had gone behind the rhetoric and researched how nearly eight decades’ worth of huge, unfunded liabilities had trumped campaign promises and driven the 2015 tax increase, the advocates said. Malloy acknowledged something very similar this past December when he announced his new plan to mitigate spiking state employee pension costs by deferring billions of dollars in contributions until after 2032. “They (GE officials) could look at the same charts we could look at and understand that the state was not in a position, and would not be in a position, to meet its obligations,” the governor said. But even as Malloy and legislators were taking heat over their reversal on taxes, they again promised major — and costly — new initiatives despite strong evidence they would quickly become unaffordable. The first five years of the governor’s new 30-year transportation rebuilding program. And Democratic legislative leaders’ plan to share sales tax receipts with cities and towns — including a much touted freeze on car taxes in about 60 communities with high property tax rates. But a nonpartisan fiscal analysis attached to the same budget bill that established these investments warned state finances faced a deficit in two years that was 50 percent larger than the cost of both programs combined. And since then, both initiatives have slowed considerably. Cities and towns were supposed to share $246 million in sales tax receipts this fiscal year but only received $185 million. But to help pay for the revenue-sharing, state officials cut other municipal grants by about $100 million from the original 2016-17 budget. And the car-tax freeze was scaled back significantly. Plans to cap municipal taxes on vehicles at 32 mills were modified to 37 mills. According to the Connecticut Conference of Municipalities, only 17 of 169 cities and towns were taxing vehicles at a rate higher than 37 mills when the state budget was adopted last spring. The modification squeezed several blue-collar communities out of the program, including Bristol, Meriden and Windham. Meanwhile, the initial investment in transportation was cut more than in half this fiscal year. Nonpartisan analysts estimate the Special Transportation Fund will operate in the red beginning in July 2018. And the study panel report recommending tolls and fuel tax hikes to fund the final 25 years of the transportation program has not been acted upon by the governor or the legislature. Municipal leaders, who were forced to accept a controversial local spending cap in exchange for the promised sales tax money, didn’t hide their frustration when they visited the Capitol last March. “Get rid of that (sales tax) money, get rid of the cap, and just leave us alone,” said Ridgefield First Selectman Rudy Marconi, a Democrat. Democratic legislative leaders, in turn, charged their Republican counterparts have tried to be all things to all people in recent years — something impossible in tough fiscal times. Republican legislators, who have been in the minority in the legislature for almost all of the last 30 years, also consistently have opposed tax increases and reductions to municipal aid. The majority of their proposals to cut spending have been tied to state employee wages and benefits — and many of those hinge on concessions unions have been reluctant to provide since 2011. Some say efforts to put a pleasant spin on Connecticut’s grim fiscal outlook is not a new phenomenon. All that’s changed, they say, is that the situation now is even more dire. Former state Comptroller William E. Curry Jr., a Democrat who lost the 1994 and 2002 gubernatorial contests to Rowland, said the Republican governor wasn’t the only one interested in hiding red ink during their rematch 15 years ago. 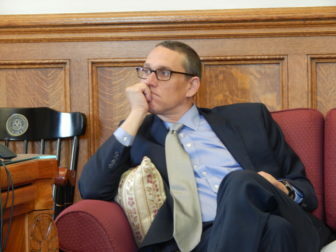 “He had been in violation of the law for the better part of a year” by ignoring or understating deficits in official financial reports, Curry said, adding that Democratic legislative leaders were no more interested in acknowledging Connecticut’s problems. “Nobody lifted a finger or said a word,” Curry said. 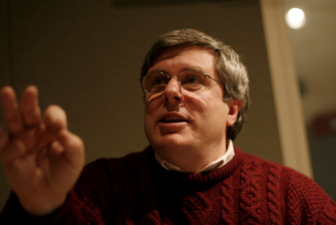 North Branford Republican Robert Ward, whose 31-year career in state government featured 22 years in the House between 1985 and 2006 — including 12 as minority leader — said “people saw little political benefit to addressing” massively under-funded retirement benefit obligations. Those few lawmakers who did worry one or two decades ago about state government’s long-term outlook were told Connecticut’s debt problems could wait.